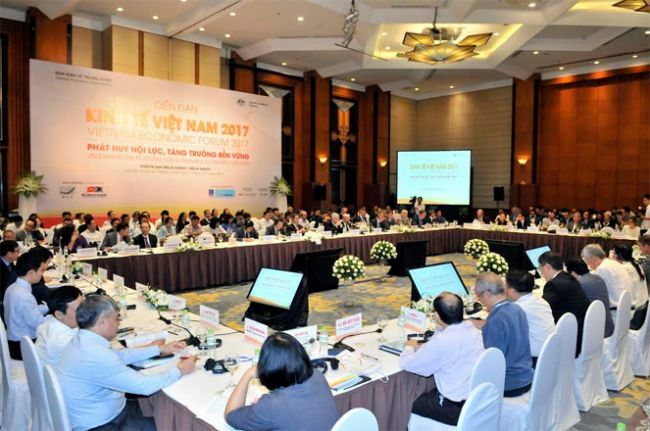 With the theme “Promoting Internal Strength, Sustainable Growth”, the Vietnam Economic Forum (VEF) 2017, hosted by the Party Central Committee’s Economic Commission in coordination with the Australian Embassy in Vietnam, was held in Hanoi on June 27, identifying the challenges and opportunities during Vietnam’s current economic circumstances. Since the Communist Party of Vietnam introduced the “doi moi” (renovation) policy in 1986, Vietnam’s economy grew at an average annual rate of 7.5 per cent in the 1991-2000 period and 6.4 per cent since 2000, with a poverty rate now standing at less than 3 per cent compared to 50 per cent in the early 1990s. In 2008, Vietnam surpassed the $1,000 annual per capita income milestone and transformed from one of the poorest countries in the world to a lower middle-income country. “This was a significant achievement,” Mr. Nguyen Van Binh, former Governor of the State Bank of Vietnam and now member of the Party Central Committee’s Commission for Economic Affairs, told the gathering. But the current economic structure has only changed slowly. Growth still comes primarily from external forces while exports have been largely dependent on the foreign direct investment sector and local companies still mainly export goods with little added value. “Cheap labor, Vietnam’s main competitive advantage, will not last forever,” Mr. Binh emphasized, adding that Vietnam has reached the end of its current growth model and only a policy breakthrough will turn it into a higher-income country. Investing in infrastructure to boost the private sector, improving public governance, and creating a transparent and stable environment for long-term investment and human resources development are the three key pillars Mr. Jay Rosengard, a lecturer in public policy at the Harvard Kennedy School, suggested Vietnam’s policymakers focus on. Vietnam has set a GDP growth target of 6.7 per cent for this year, similar to the target last year, and the macroeconomic situation in the first half of the year has been quite stable, according to Deputy Minister of Planning and Investment Dang Huy Dong, adding that GDP growth has been estimated at 5.5 to 5.7 per cent during the January-June period and is on track to reach the government’s target. But not every policymaker agrees with the ambitious GDP target. Local banking expert Dr. Can Van Luc believes the country should not exploit more crude oil to reach the target, but instead should promote consumption and tourism while improving the local business climate. Director of the Central Institute for Economic Management, Mr. Nguyen Dinh Cung, said the country’s economy may grow at 8 to 9 per cent. Such high growth, however, would only be achieved by improving the efficiency of State-owned enterprises (SOEs), which have $300 billion in assets, and by boosting the private economic sector, which has $200 billion in assets. Regarding interest rates, there will be more challenges to stabilize deposits rates in the remaining months of 2017 compared to 2016, as inflation and interest rates are expected to increase because the US Federal Reserve is projected to make at least three interest rate hikes this year. The government could accelerate banking sector reforms to eliminate anomalies that help perpetuate the gap in risk-free rates and general rates. Currently, one-year government bonds yield 3.5 per cent but one-year deposit rates and lending rates are around 6.5 per cent and 10.5 per cent, respectively. As Vietnamese banks face difficulties raising capital because of the government’s 30 per cent foreign ownership limit, another factor distorting market interest rates is the government’s gradualist approach to dealing with the country’s legacy non-performing loans (NPLs). Less than 20 per cent of the NPLs purchased by the Vietnam Asset Management Company (VAMC) have been resolved. Vietnam’s NPLs ratio in 2015 was the highest in ASEAN, at 3.44 per cent, compared to 2.68 per cent in Thailand, 2.43 per cent in Indonesia, 1.89 per cent in the Philippines, 1.6 per cent in Malaysia, and 0.92 per cent in Singapore, according to information presented at the Forum.